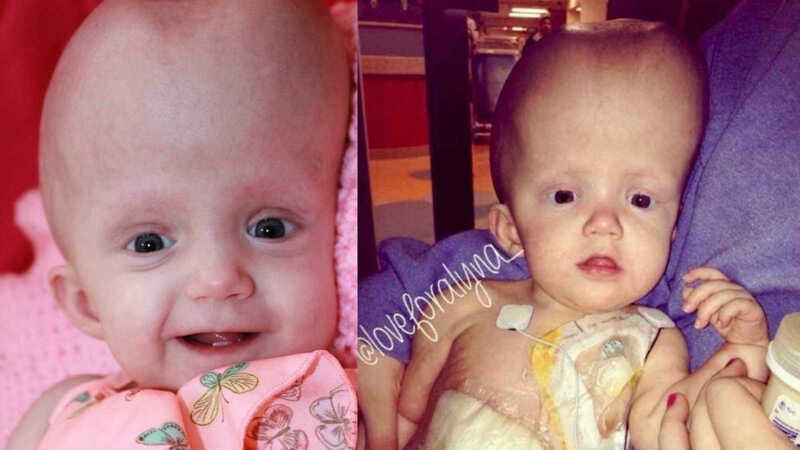 ‘There’s nothing we can do.’ My week-old daughter had Stage 3 brain cancer. Terminal. No life expectancy. “I always knew I wanted to be a mom. From as far back as I can remember, even being 5 years old, I remember I couldn’t wait for the day I had children of my own. My mother has always told me I was a ‘mother hen.’ I took care of my little sister, cousins, any of my mom’s friends who had children, that’s where you could find me… taking care of the babies. So, imagine my excitement when it was finally my turn! Although it wasn’t an ideal situation, I was 17-years-old and pregnant. My boyfriend at the time, I thought was the love of my life. We had only been dating for a month when I fell pregnant. Sure, as I said, it wasn’t what others would call ‘ideal’ but I never for a second regretted my situation. 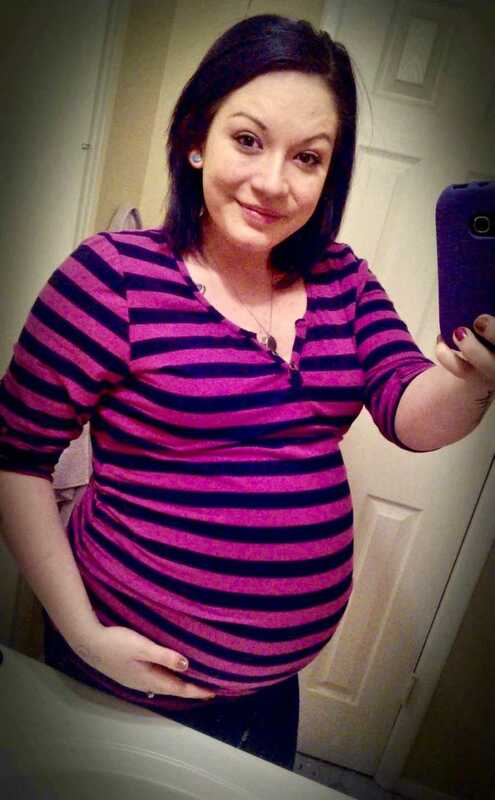 My pregnancy was far from easy. I was sick everyday up until about 6 months pregnant, I gained 100+ pounds, I was constantly going into early labor and at 16 weeks I was involved in a hit and run drunk driving accident. The impact of the crash unfortunately caused my daughter to have a stroke in utero and from that she developed hydrocephalus, which in the simplest of terms is a brain condition that prevents the Cerebrospinal fluid from draining as it should. I was unaware of my daughters’ condition until I was 34 weeks pregnant when I made the choice to switch doctors. And thank God I did. During our first appointment with my new doctor, he requested we have a sonogram done to check her size and weight just to be sure she was on track development wise. I remember the look on the ultrasound technicians face when she realized something wasn’t right, except legally she wasn’t allowed to tell us that. She excused herself and went to inform my doctor of her findings. To be honest with you, I don’t remember much from that conversation, it was like I had fallen down a hole and her words were so far away I could barely hear her. I never really knew what ‘tunnel vision’ meant until that day. My doctor referred us to a neonatologist in our area so that she could also run her own tests and in the meantime, I did the worst possible thing you could ever do when given a diagnosis for your child… I googled it. I was terrified, I had no idea what my unborn child’s life expectancy was. Would she even be born alive? If she was, would she be a vegetable? How did this happen? And what did I do wrong? These were all just a few of the millions of questions running through my mind. I had no time to digest this news, no time to research, no time to prepare. I went into early labor and delivered my daughter via emergency C-Section less than a week later. The day I was admitted to the hospital is all a blur, all I can recall were doctors and nurses and specialists asking me and my ex-husband if we wanted to sign a DNR in case she was born still. The odds were definitely not in her favor. 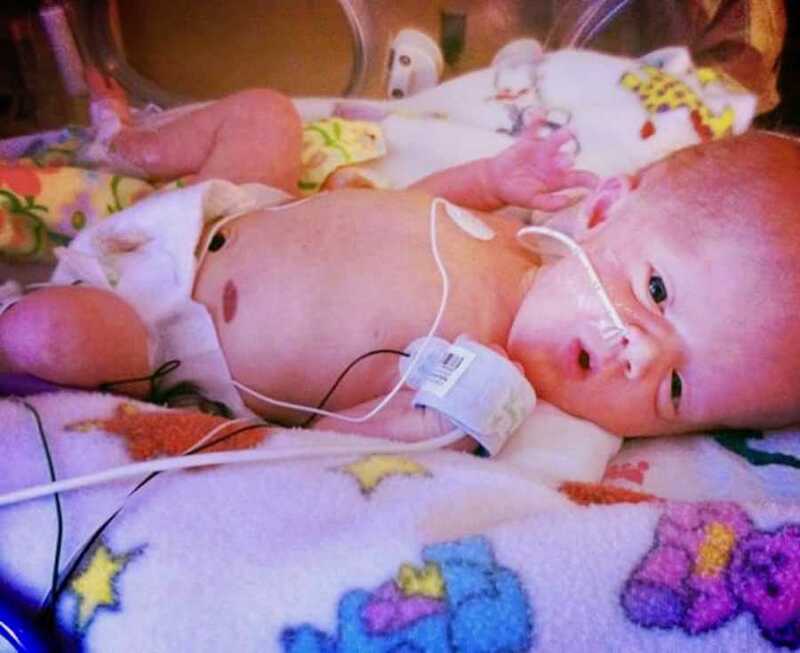 We were warned that it was likely she wouldn’t be able to breathe on her own once she was delivered. They rushed me into the OR, it was freezing in there. I remember shaking from fear so much that my body became stiff as a board. There I was, lying on the operating table looking straight up to the ceiling, 18 years old, first time mother, asking God to let my girl live. Begging him to let me care for her, I knew I could do it. I had to. She was mine and I wanted her, in any shape or form I could have her. I needed her. My whole life, I waited for this moment, and it was here. January 19, 2013 at 5 weeks early, Alyna Marie Judith Moore graced the world with her beautiful presence weighing in at 7lbs 13oz. She was immediately intubated and taken from me. Everything else is a distant memory, I can’t remember much of anything and if you’ve ever had a C-section you know why. It’s all so confusing and scary. My world crashed. I remember later that evening, collapsing in the shower at our hotel and crying so much it felt like my tears would dry up. They didn’t. I cried for days and the tears never stopped coming. What was supposed to be the happiest few days of my life were the most painful and traumatic moments I’ll ever experience. My daughter was going to die. We didn’t know exactly when, but we were told she would and to expect it soon. 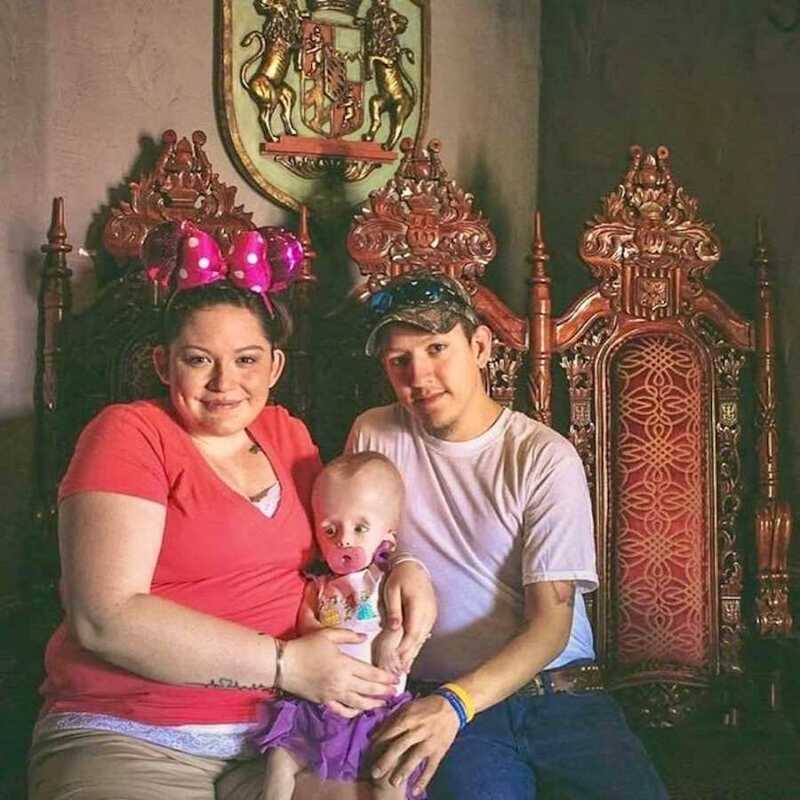 Alyna was discharged and sent home on hospice care, we were informed she wouldn’t live to make it to her first birthday, but 6 months later she was removed from hospice care because of how well she was thriving. Her hospice nurse referred us to a local pediatrician who then referred us to a pediatric neurologist in Lubbock. Our first appointment I remember him walking in, looking at her in awe. 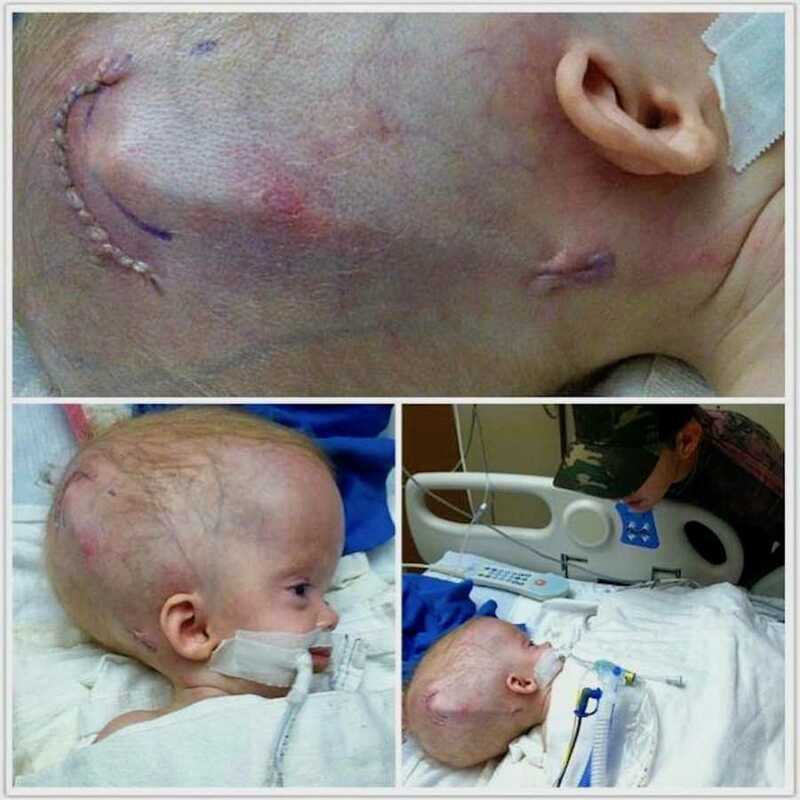 He said this was one of the worst cases of Hydrocephalus he had ever seen but that he knew he could help her. The very next day Alyna underwent her first brain surgery where they place a shunt, which drained the excess fluid in her brain. And while she was under they did a biopsy of her brain tumor, so they could determine what type of cancer she had and what could be used to treat it. Stage III Anaplastic Astrocytoma. Most commonly diagnosed in middle aged men. She began chemotherapy treatment shortly after. The first round did wonders, and her tumor shrunk 50%, the second round, not so much. Unfortunately, between the constant shunt revisions, which are surgeries to readjust her shunt to drain the proper amount of fluid, chemotherapy appointments, specialist visits, and physical therapy, her cancer spread throughout her entire little body. 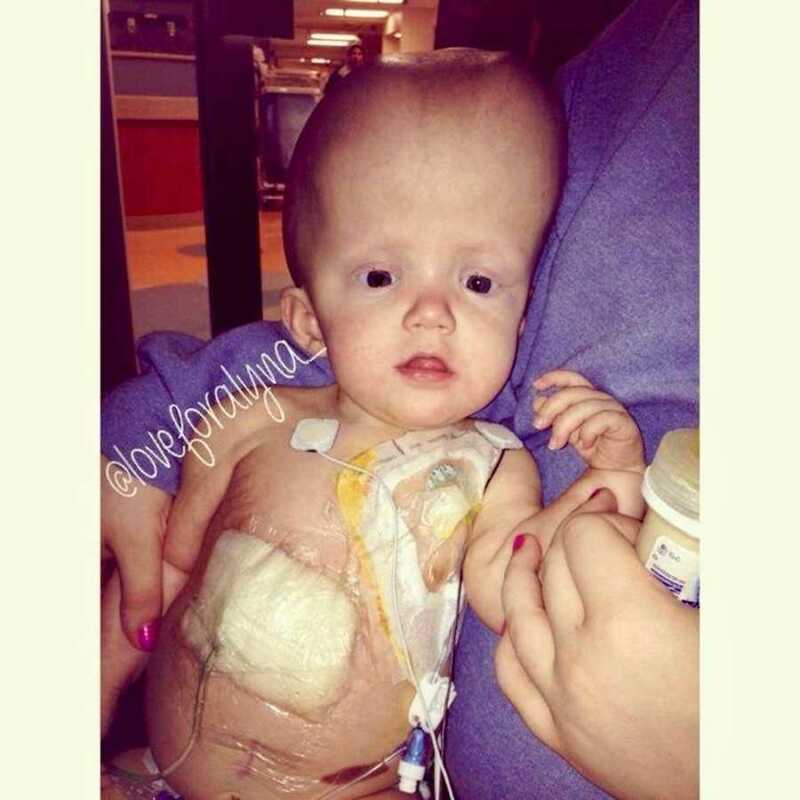 She was once again placed on hospice care and sent home to be ‘kept comfortable.’ How in the world can you keep a 15-month-old comfortable when they have not only a severe brain condition but cancer consuming their entire body? My ex-husband and I decided Alyna deserved to live the life she should’ve had. We took her to Disneyland in hopes she would get to experience life as a one year old, not a cancer patient. And she did. She loved the princesses the most! Those few days in California were the most ‘normal’ life we ever lived. I will treasure those moments for the rest of my life. On the day we were to return home, I woke up early in the morning to get our things together and noticed Alyna’s breathing was off. She was completely unaware, she was alive, but unresponsive. We contacted her hospice nurse who told us the time was here, and we had the choice to take her to a local hospital or stay where we were and keep her comfortable with her medication and wait for her to leave us on her own time. After an emotional discussion, Alyna’s father and I decided it would be best to keep her with us. Alyna spent her whole life trapped behind hospital walls and the last thing I wanted was for her to die there. So, we stayed right where we were for 3 days, soaking in all the cuddles we could. Covering her in kisses from head to toe. I held her for 3 days and couldn’t bring myself to put her down. I couldn’t sleep for 3, almost 4 days when my ex-husband convinced me I needed to rest. He was right. How could I take care of her properly if I was delusional from no sleep? We laid down in bed, all three of us, our last moment as a family of three. And when I woke, she was gone. I believe my sweet girl knew my heart couldn’t take the pain of witnessing her last breath, so she waited for me to sleep. She waited for my heart beat to slow, my nerves to calm and my mind to be at ease when she decided it was time to leave. 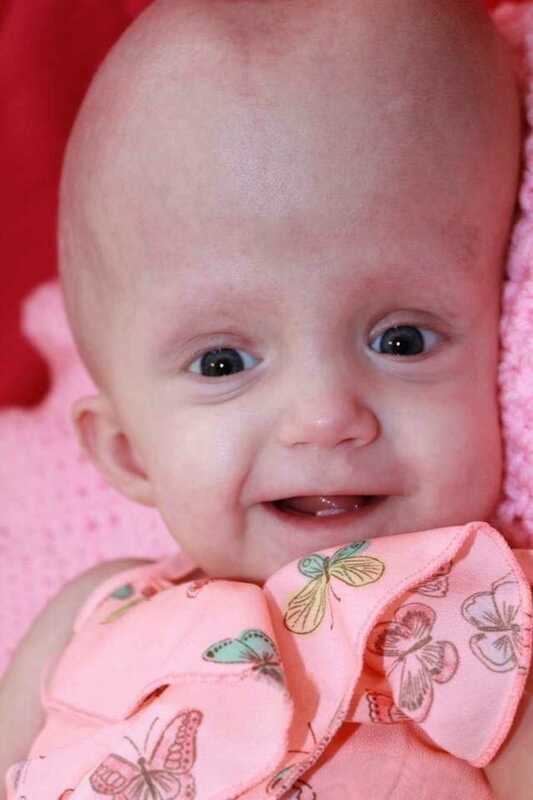 Alyna lived for 457 days. That’s 450 more than we were told she would! From the day she came into this world she had all the odds stacked against her, and every single day of her life she beat the odds. We were on her time, and she knew she was going to live. She knew what she was capable of and she also knew when she was tired, she knew when it was time to go. 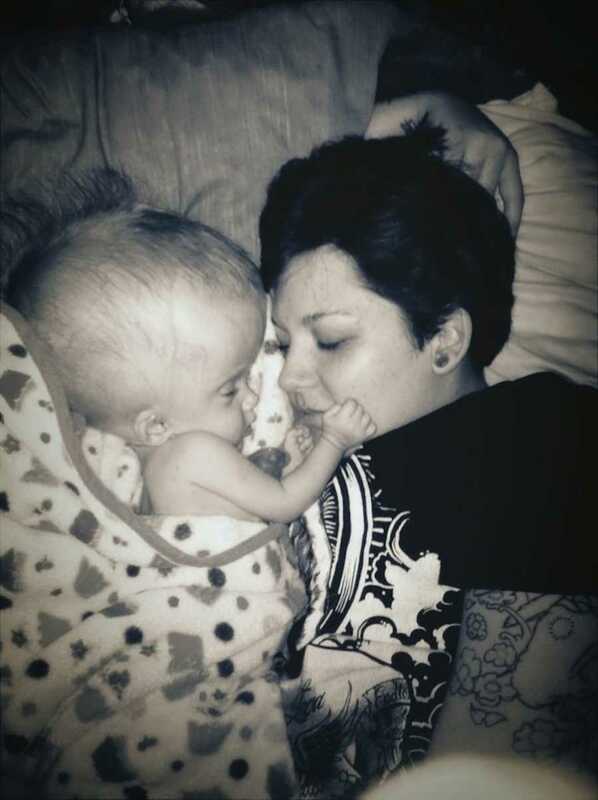 She knew Mama and Daddy couldn’t bare to live this life without knowing her smile, her voice, her smell, her laugh. So, she lived. That’s when it all started, when Alyna lived. 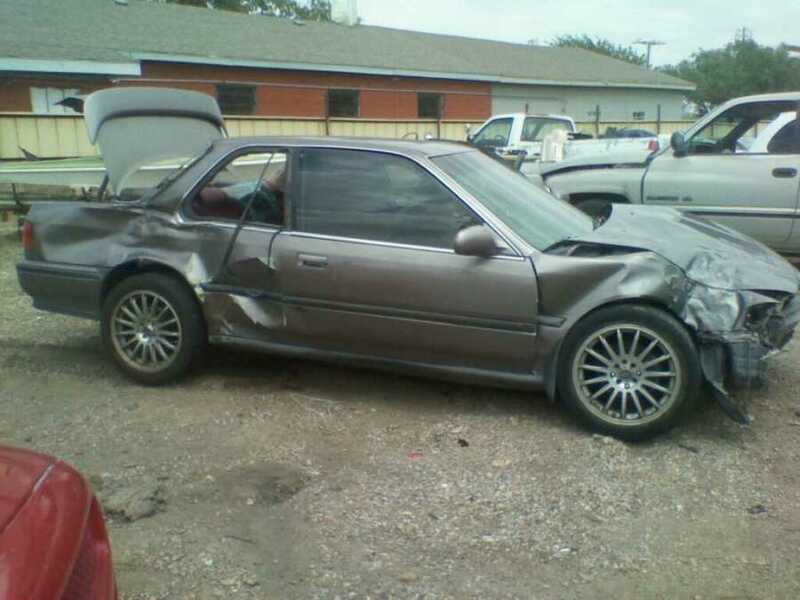 Alyna died April 21, 2014. This story was submitted to Love What Matters by Lakota Moore, 23, of Amarillo, TX. Follow Alyna’s Facebook page Love from Alyna – Childhood Cancer Foundation here. Submit your story here, and subscribe to our best stories in our free newsletter here.